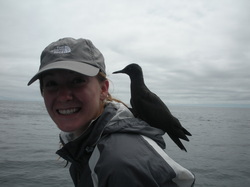 I am interested in the evolution of host-parasite interactions within a community ecology context. I am currently working on my honors thesis with Dr. Noah Whiteman and Dr. Jennifer Koop. My project is looking for evidence of host-race formation in the Desert mistletoe, Phoradendron californicum. This dioecious, hemiparasitic plant is part of a keystone ecological interaction in the Sonoran Desert. Desert mistletoe fruit in the winter months, providing an important food source for Phainopepla (Phainopepla nitens), a common migrant bird. I will be developing microsatellite markers for mistletoe samples taken from Palo Verde trees and Velvet Mesquite trees, as well as attempting to map a chloroplast genome for each. We are also performing a reciprocal transfer experiment to determine if mistletoe experience differential survival on varying host tree species. I grew up in Tempe, Arizona, and moved to Tucson in 2009 to pursue a B.S. in Ecology and Evolutionary Biology with a minor in Spanish. In my spare time, I enjoy hiking and camping around Tucson, reading, baking, and cooking (and eating). 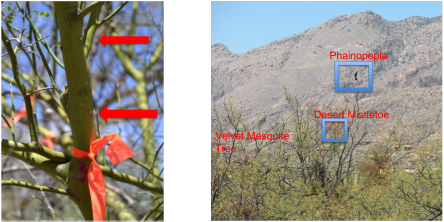 Left: Two mistletoe seeds placed on a branch of a Palo Verde tree for the reciprocal transfer experiment. Right: A Phainopepla perched on the top of a Velvet Mesquite tree infected with a desert mistletoe.